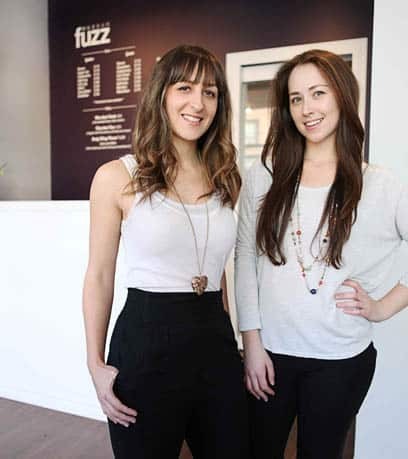 Tired of waxing being a hassle, Jessica Frampton and Florence Gaven decided to take inspiration from the wax-only emporiums in Europe and open their own wax bar, Fuzz, on Queen West. This entrepreneurial team mixes marketing with managing to head up their unique business with a passion for adventure. Thursday is a super busy day for us here at Fuzz Wax Bar. But then again, every day is—which is so awesome! We live just a few blocks from each other and have pretty much the same morning routine. Wake up, hop on the laptop and check emails (while still in bed), have a quick bite to eat, shower, coffee to go and then we meet up on the streetcar for our morning commute. We arrive at the shop at 9:30 a.m. and our wax experts arrive shortly after to prep and get ready for our first appointments. One of us is always here to greet our clients from the moment our doors open at 10 o’clock. We love getting to know the people that come into Fuzz, after all building great relationships and creating members is an important part of what we do. Throughout the day we’re greeting clients and getting them ready for their appointment, which might include providing information or reassurance about what they can expect. We busy ourselves booking appointments, signing up new members, responding to emails and following up with clients by phone or email. We take some time to update our social media outlets like Twitter and Facebook. It’s a great way to stay connected to our new and prospective clients. We also have the management side of the business to tend to—ensuring our staff gets their breaks, doing inventory, payroll, scheduling and marketing. Around 2 p.m. we usually step out for a coffee break to discuss business and take a breath of fresh air. However we’re never too far away. We usually sip our lattes sitting directly across the street at Niche Café so we are close at hand, if needed. We close our doors at 8 p.m. (unless there’s a last minute client who pops in) and after that we tidy up and balance our books, we usually arrive home around 9:30 p.m.
Today we worked together, but being partners has its perks. We’ll rotate opens and closes, and schedule days off when needed. You know… to squeeze in a workout, a night out or just catch up on sleep. We love our busy little lives and wouldn’t change it for the world. At the end of the day we sit down with a nice glass of wine and put our feet up! Jessica: Went to School for Event Planning. First job out of school was as a Freelance Event Planner. Florence: Went to school for Advertising, then Film & Television. First job out of school was as a Camera Assistant. We love how random this career choice was for the both of us. We never expected to be salon owners, and now that we are we just want to savor every minute of this adventure we have created for ourselves. Plus, we love having the freedom to make our own decisions and have the final say. Being your own boss is fun! – Don’t think that because you play by the rules everybody else does. When people feel threatened they will do anything to take you down or discourage you. But as long as you are confident in what you’re doing and do it well, there’s nothing to worry about. We’re true believers in having good karma on your side. – It’s inevitable that there will be hard times where you feel unmotivated and discouraged, but keep on track, stay focused, and you’ll do just fine. – Always expect the unexpected! Florence: If I wasn’t so shy, I would love to be a singer on Broadway. Jessica: Any career that would allow me to travel the world!